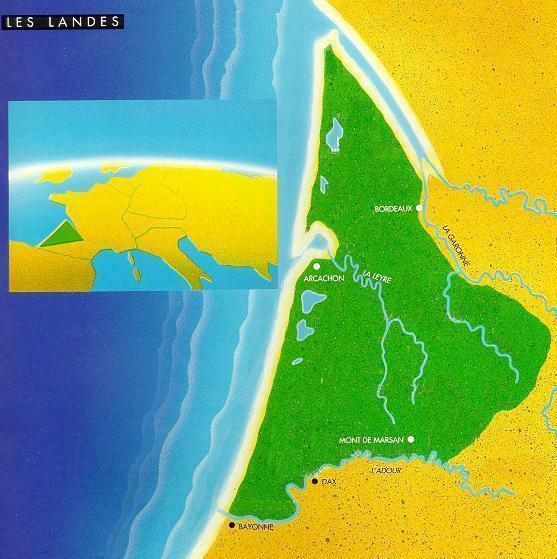 The region of the Landes is an immense plain situated in south-west France. This district is delimited by the Atlantic Ocean to the west, by the banks of the Adour to the South and by the ones of the Garonne to the north-east. Today it shelters the largest forest in Europe, constituted essentially of pine trees planted in the middle of the 19th century on Napoleon III’s spur. The first stilts appeared really before the forest. At that time, the Landes were an immense boggy country, very flat, where the vegetation was essentially constituted of herbs and brushwood. In this landscape, lived particularly shepherds. 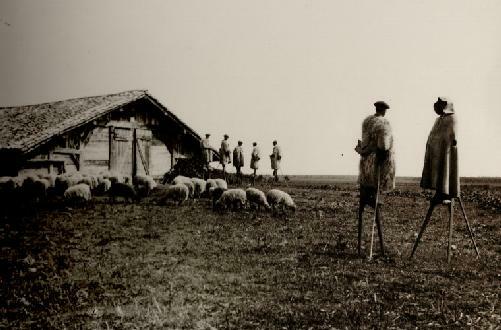 In order to clear more easily a way through the vegetation, to avoid getting their feet wet in the bogs but particularly to be able to observe from a distance their herds of sheep, the shepherds used stilts. The first testimonies of existence of the stilts date back from the beginning of the 18th century. But how long have they existed? Were they invented by the Landes’ shepherds or were they brought by the Flemish who had used them since the Middle ages? So many questions that nobody can answer with confidence. - the “paouse pé” (“foot rest” in of the Landes’ dialect), set on the “escasse”. Usually, its height included between 90 cm and 1 m 20. The man on stilts attaches the stilts to his legs with two thongs of skin. The practice of the stilts used in a utilitarian way by shepherds disappeared progressively between the middle of the 19th century and the beginning of the 20th century. Indeed, the planting of the forest drained the marshes but also led to the disappearance of the pasture land and the sheep and their shepherds on stilts with it. But at the same time, the shepherds began using the stilts for plays and they mingled with other villagers to dance. Thus appeared in 1889 the first group of dancers on stilts founded in Arcachon by Sylvain DORNON. Its first dance was “Lou Quadrilh dous Tchancats”. This man was also at the origin of numerous epics on stilts, rejoining in 1891 Paris to Moscow, that is 2850 kilometres in 58 days. Today, there are 21 folk groups from the Landes which pay particular attention to perpetuating their ancestors’ dances on stilts. A number of their members take part in races on stilts in the Landes folk groups federation tournament and some, to the Sylvain DORNON’s image, set their hearts on accomplishing runs of several hundreds of kilometres.